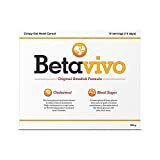 Betavivo is a crispy oat heart cereal with a high content of beta-glucan, which is proven to lower your cholesterol and blood glucose*. Each single serving contains the required amount to achieve positive health benefits. Betavivo is recommended for you if: You need to lower your blood cholesterol You have impaired glucose tolerance (such as metabolic syndrome, pre-diabetes or type 2 diabetes) You wish to maintain normal blood cholesterol levels and a healthy heart How does it work? Reducing your cholesterol levels: Eating one daily serving of Betavivo provides the required 3g of beta-glucan from oats needed to reduce your blood cholesterol. It works by encouraging your liver to use cholesterol in your bloodstream to produce bile acid (needed to digest your food). If eaten daily, you will normally see a reduction in your cholesterol levels in about 2-3 months. However, if you continue to eat it over a longer period of time, you will increase the chance of reaching your cholesterol target. Reducing blood glucose levels: After you have eaten, your blood glucose levels increase. Eating beta-gluten from oats as part of each meal helps to reduce the amount of blood glucose your body produces by slowing down the absorption of carbohydrates. This effect on blood glucose occurs each time you eat Betavivo. * These health claims have been examined and approved by the European Food Safety Authority (EFSA).